Pry open any Android-powered game console on the market today, and you'll likely find a mobile processor -- an ARM-based chip originally designed for tablets, smartphones and maybe the odd specialty device. It seems to make sense -- after all, isn't Android a mobile OS? Christopher Price, CEO of Mobile Media Ventures, doesn't seem to think so. "Android is the future of personal computing," Price told Engadget. "Even on the desktop." According to Price, developers just haven't had a chance to play with a truly powerful Android gaming machine. So, naturally, he's building one. Despite its Apple-esque name, the iConsole.tv is billed as the most powerful Android device to date. It's a bold claim, but the specs add up: the company's Unit 00 developer kit runs Android on a 3.3GHz Intel Ivy Bridge CPU, 8GB of DDR3 RAM and two 500GB hard drives. Graphics are handled by Intel's integrated HD 4000 chipset -- a surprisingly capable GPU, though still a far cry from dedicated hardware. Price stressed that these specifications are for the $999 developer version the company announced today. 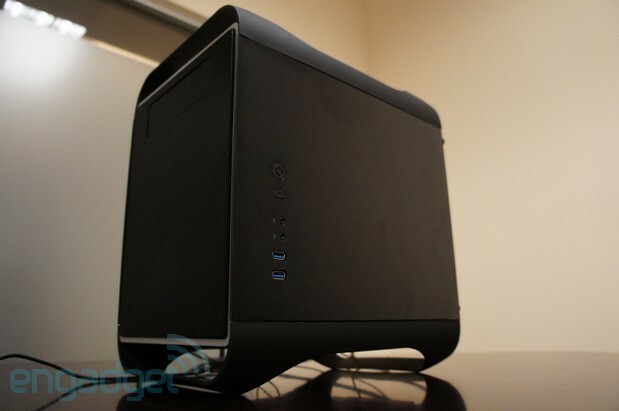 The final product's build hasn't been finalized, but we were told it would ring it at a notably lower price. Still, considering all that power, we had to wonder why MMV chose Android. Price reiterated the potential he sees in the platform. "We're pushing the envelope and adapting it for high-performance gaming, but we see Android being the change agent in personal computing, on the TV and the desktop. People hate walled gardens, and they hate maintaining their PCs. Android can solve that, and we're going to help make that happen." It's an arresting take on the future of computing, but the team is at least being realistic about it. "We want to make Android work for everything you think a desktop operating system can do. That might not happen overnight." Users will have the option of activating a Linux desktop mode: easy access to a traditional computing environment. This also lets users run Steam, and may even make the iConsole the first third-party Steambox, albeit unofficially. Even so, Price says their goal is to make the Linux desktop unnecessary. "We want gamers to never need to use it, but it will always be there if they want to use it." We dropped by the firm's Santa Clara office to see exactly what an x86 Android PC is capable of, running the desktop-sized developer unit through a few common Android benchmarks. The machine didn't disappoint: Unit 00 scored 78,044 on Antutu -- besting the GS4 by a factor of three. Android 4.2.2. was naturally snappy on Intel's desktop chipset, and at least as usable as a Transformer Prime in a keyboard dock. Games ran swiftly too, but many weren't realistically playable for the lack of a touchscreen. Price told us that the a dedicated controller was on the way, and that the iConsole will eventually feature a 10-foot interface designed specifically for use on an HDTV. Even so, users will always have the option to drop down to the stock Android experience. We asked about the Linux environment, and Price rebooted the computer to a traditional desktop. Here we felt right at home: it's desktop Linux, and it worked exactly as we expected. We booted up Steam and tooled around with the Half Life 2 Linux beta, throwing barrels at enemies without a hitch. Tuned to medium settings by default, the game didn't stutter on Unit 00's Intel HD 4000 GPU. Price told us that MMV is working on tweaking the chipset's clockspeed to improve performance, but reminded us that the graphics solution and internals of the final product still haven't been determined. Unit 00 serves as a jumping-off point for developers, giving them a change to play around with a powerful, stable x86 machine running Google's mobile OS. The iConsole may not be the first Android-based game console we've seen, but it's certainly the most ambitious -- aiming not only to supplant modern game consoles, but also desktop computers. 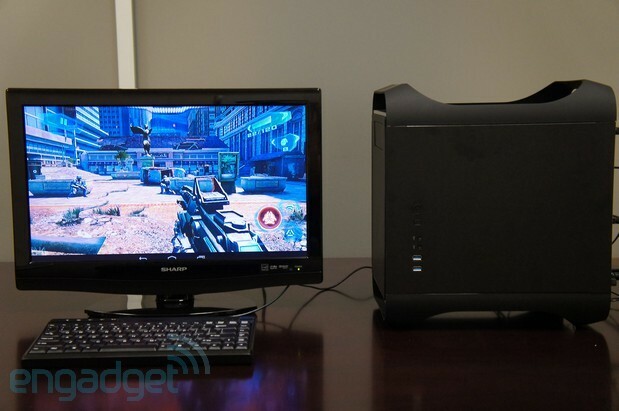 Says Pierce, "Really, we think the gaming console is the future of the desktop. It's a central device that should store all your big files, your media, and do all the heavy processing for the household. It's not a huge leap to plug in a keyboard and mouse and enjoy iConsole.tv as a PC, too." It's a little difficult to imagine using Android as our primary desktop operating environment, but Price's passion is unwavering. We can't say if the home computing paradigm will shift in his direction, but we're definitely looking forward to seeing where he takes the iConsole.tv. Check out the company's official press release below. SANTA CLARA, CA - Mobile Media Ventures, Inc. (mmv.mobi) today introduced iConsole.tv - a new Android-powered gaming console. The platform delivers the most powerful Android device to-date, combined with new innovations that enhance the Android experience for gamers. iConsole.tv is powered by an upcoming x86 processor and GPU that will deliver up to five times faster performance than any Android device released to-date. The iConsole.tv Developer Kit, Unit 00, is now available for order to developers only, and will ship within the next 30 days. "Our developer kit's availability is a real turning point for Android, and for the team here at iConsole.tv" said Christopher Price, CEO. "It's not only the fastest Android to-date, but paves the way for the production iConsole.tv, which itself will be up to three times faster." The production iConsole.tv is slated to be available this winter. iConsole.tv centers around the Android system, with new enhancements that allow it to function both as a next-generation gaming console, and also as a future generation of personal computer. Armed with dual HDMI outputs, iConsole.tv will enable developers to optionally expand games onto two televisions at once. Additionally, iConsole.tv will dramatically reduce the royalty rates that game developers pay to publish traditional console games, making games cheaper for consumers. Connected television will be a major centerpiece of iConsole.tv - with planned availability for ATSC, CableCARD, and Protected DLNA media gateway support. iConsole.tv will support how most Americans obtain television today, and opens the door for direct-streaming television to become mainstream. Finally, iConsole.tv will feature a Linux Desktop mode, delivering a protected version of the Linux platform inside of the Android set-top box. The Linux Desktop will be available as an option, allowing for Steam for Linux and other powerful computing applications. "We think Android is the future of both gaming and computing, but we felt it important to also be the first 'box' that welcomes Steam and other Linux apps with open arms." iConsole.tv operates outside of a "walled garden" - a key differentiator from other powerful next-generation consoles. While parents and owners can impose controls, gamers will be free to run games and apps without a corporate giant controlling their experience, or blocking certain apps and services. The iConsole.tv Developer Kit, Unit 00, and Developer Program will cost $999. Pricing and final specifications for the production iConsole.tv will be announced at a later date.